When relying on consent as your legal basis for processing, the GDPR says the consent you obtain must be freely given, specific, informed, and unambiguous. You also must clearly explain how you plan to use their personal data. We’ve updated Mailchimp signup forms to help you stay compliant with this law. Our optional, GDPR-friendly forms include checkboxes for opt-in consent, and editable sections that explain how and why you are using data. In this article, you’ll learn how signup forms can help you comply with the GDPR. Just enabling GDPR fields on your signup forms will not make you compliant. It’s the first part of a multi-step process. Here’s how it works. Turn on GDPR fields for the signup forms for each audience affected by the GDPR. 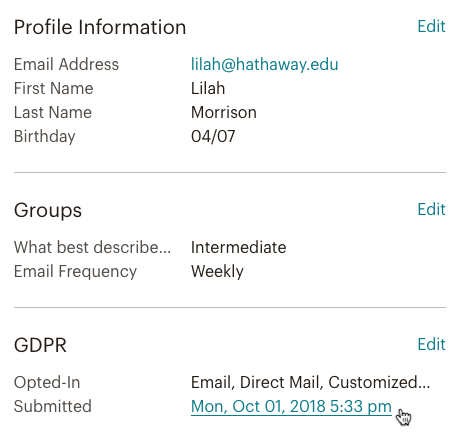 Mailchimp provides suggested language for GDPR fields to make it easier for you to create your GDPR-friendly forms. You might need to edit this language to fit your marketing plan, so be sure to review it carefully. If you choose to write your own descriptions, make sure you’re explicit about why you’re collecting data. Segment your audience based on the marketing permissions you receive from your signup form. You don’t have to wait to collect your data to create segments. After you create and save your segments, you’ll be able to access them anytime. Give your segments descriptive names so you can find them easily. After you save your changes in the form builder, that signup form will include GDPR fields on compatible published forms. 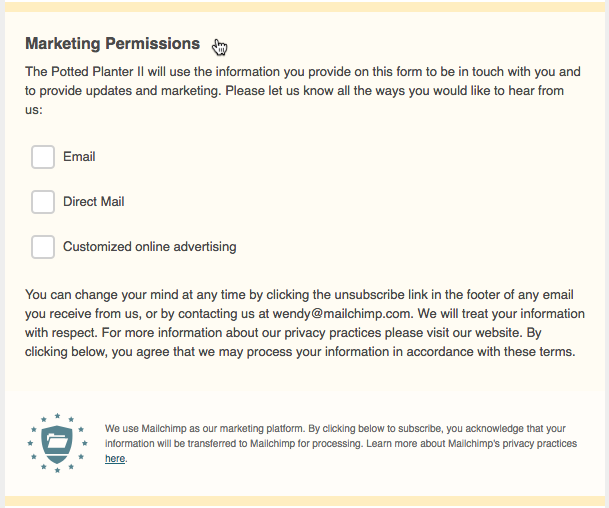 New contacts that use your signup form will be able to give explicit consent to your marketing. You’ll also need to collect GDPR-friendly consent from the contacts you already have. Send an email to everyone on your audience that includes a link to update their settings. After you save your segment, use it to send your email or ad campaign only to the people who have given consent through your signup form. GDPR form fields include checkboxes that your contacts will use to opt-in to your marketing, and space for you to add necessary information. Mailchimp provides suggested language that you can edit to fit your marketing plan. Make sure each section accurately describes your marketing activities. This table explains what you need to include in each field. Description This field describes why you are collecting the information on your form, such as providing marketing and product updates. Options This field uses checkboxes to get consent for each marketing activity you conduct. Mailchimp will provide a few common marketing activities to choose from, and you can add your own. Remember that each marketing activity must be clearly communicated and requires separate consent. Legal Text This field explains how you’ll use contacts’ data. Statements you make in this section must be consistent with your practices, so be sure to edit this field to meet the needs of your business. Include your contact details on the signup form - the GDPR requires the organization collecting the personal data (that’s you) to identify themselves. Let your customers know they can change their mind at any time with the Unsubscribe link. If you plan to use data you collect from your contacts to advertise online, clearly explain your advertising activities and make sure your Cookie Statement describes any cookies or tracking technologies you might use. If you’re not sure, Mailchimp’s Cookie Statement includes a section called Cookies served through the Services that describes technology you (or your website) might use, depending on the features you use through Mailchimp. Which forms are compatible with GDPR fields? After you enable GDPR form fields for your audience, these fields will be included on the hosted signup forms for your audience, embedded forms, update profile forms, and signup landing pages. 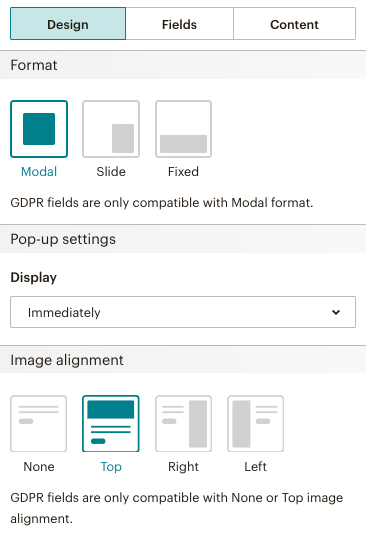 The fields will also be included on pop-up forms that use the Modal design format, and either None or Top image alignment. GDPR fields are not compatible with form integrations or Mailchimp Subscribe. To use GDPR fields on your signup forms, enable them for each audience that collects or contains personal data from EU citizens, then edit them to reflect your marketing practices. After you enable GDPR fields for an audience, they will be available to view and edit in the form builder. These fields will be included on most signup forms associated with that audience, including pop-up forms, the hosted signup form, embedded forms and signup landing pages. To enable GDPR fields for your audience, follow these steps. Check the box next to Enable GDPR fields. You’re all set. GDPR fields will appear in the form builder for you to view and manage. GDPR fields are only editable from the form builder. The changes you make in the form builder will apply to most Mailchimp signup forms, including compatible pop-up forms and landing pages. To edit GDPR fields for your signup form, follow these steps. Click Select next to Form builder. In the form builder, scroll to the end of your form and click the Marketing Permissions field. If you'd like to require your contacts to choose an option before they subscribe, check the box next to Require at least one option. When you’re done, click Save Fields. After you’ve set up your marketing permission checkboxes, segment your audience to make sure you send your campaign only to the people who have given consent through your signup form. To create and save a segment in your audience, follow these steps. In the first drop-down, choose your GDPR form field label. Create a separate segment for each marketing permission. You can add up to five conditions to create a segment that includes contacts who have opted-in to more than one marketing permission. When you're satisfied with your conditions, click Preview Segment to view the contacts that match your conditions. In the Save Segment pop-up modal, type in a name for your segment, and click Save. To learn more about managing segments, check out Save and Manage Segments. Now that you’ve updated your forms and your segments are set up, you’re ready to collect consent from new contacts and market accordingly. But, you still need your existing contacts to opt-in to your marketing permissions. Let your contacts know they need to update their profile with a consent campaign. We've created an email template to help you, or you can build the campaign from scratch. Send your consent campaign to everyone in your audience, and make sure it includes an Update Profile link. 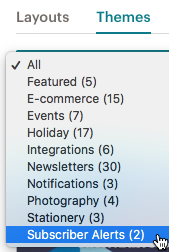 Click tracking doesn't work with the Update Profile link or other merge tags, so you'll need to use the GDPR form fields and segments to see who has updated their settings. To collect consent from your existing contacts, follow these steps. Create a new email campaign. Click the drop-down menu and choose Subscriber Alerts. 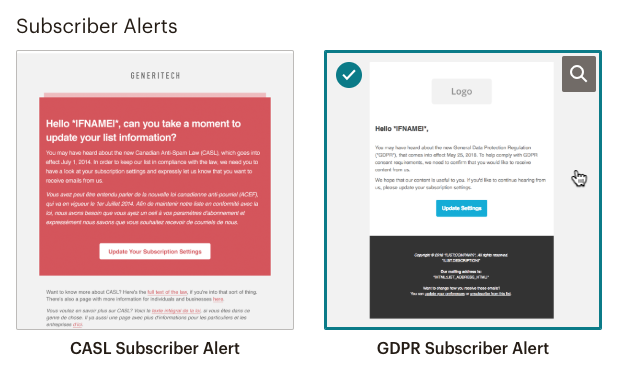 Click the GDPR Subscriber Alert template. The template includes suggested language that you can edit. Preview and test your email campaign as you normally would, and send it to your complete audience. After you send your consent campaign, use your Marketing Permissions segments to communicate only with contacts who have expressly opted-in to your marketing. You may find it helpful to bulk unsubscribe all contacts who have not opted to receive any marketing from you. We are not aware of anything that specifically prohibits you from sending a reconfirmation email. Some EU authorities recommend that businesses periodically refresh consent, suggesting that reconfirmations can still be sent. If you don’t feel like you have a proper basis under the GDPR to email a contact, you may want to refrain from sending a reconfirmation email and remove the contact from your audience. As always, we suggest you reach out to local counsel in your area to discuss the specifics of your situation. When a new contact signs up to your marketing through a hosted, embedded, pop-up, or landing page signup form for your GDPR-enabled audience, we'll record the field information in a plain-text version of your form. This captures the GDPR fields your contact saw when they subscribed, so you can show that you accurately described your marketing activities. You can view this information at any time on the contact's profile page.